When you deal with Northome Comfort Windows, you are recieving one of the stongest PVC frames on the market. This is largely because we mainly use triple pane IG (insulated glass) units in Saskatchewan. Heavy wind loads and heavy glass demand heavy duty frames. 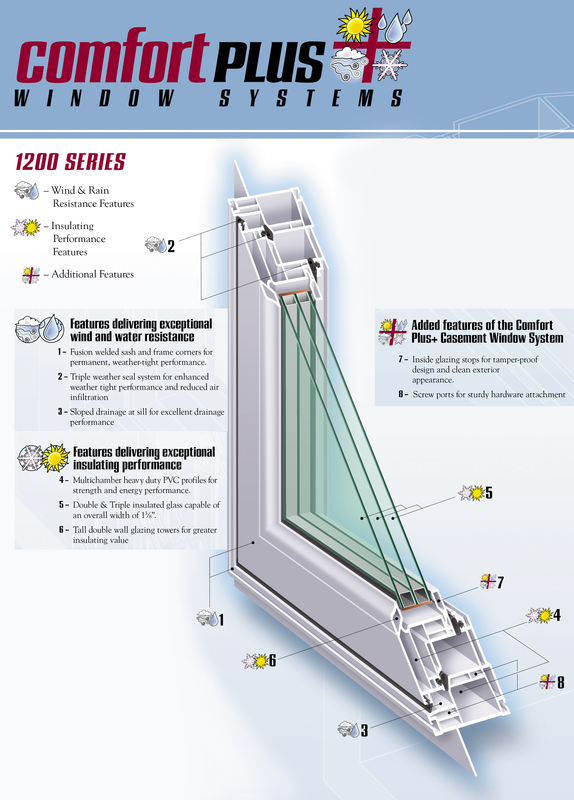 When we were getting our windows tested at the Intertek Testing Facility in Winnipeg, we felt that our windows would perform beyond the normal Residential Performance Class that most window companies test their windows at. So we decided to have our windows tested in the Commercial (CW) Performance Class. Earning a top notch Performance Grade in this Performance Class was huge to us, as this is not commom for vinyl windows as they generally do not have the required structural stength to withstand the vigourous testing that Commercial windows are required to go through. This just shows that wall thickness of your PVC window frame is an important factor when choosing windows for your home. The sturdier your vinyl frame is the more unlikely it is that you will have issues with your windows. Our frames walls are 28 - 42% thicker than any competing product on the market that we have tested. That equates to a mimimum of 2 mm on the exterior wall of the vinyl frame and 1.5 mm on the interior wall of the frame. This added thickness allows us to use triple pane glass units in our windows without compromising the structural integrity of our vinyl frame. Today there are many windows on the market that are designed specifically for double pane insulated glass units that are using a triple pane insulated glass unit instead by using a thinner glazing stop to hold the glass in place. These vinyl windows were not designed to carry the weight load of a triple pane glass unit. Unless steel reinforcement is added to their vinyl frames, they won't have the structural strength to support the added weight of the extra pane of glass, especially in our high prarie wind loads. Not only do our thick walled frames support extreme weight, they have superior screw retention without the use of steel reinforcement that can cause cold conductivity problems. Our multichamber frames act very much like a thermos, giving added energy efficiency to the system. The air in the multiple chambers not only act as an insulator, but the combination of the air and the multiwalls also acts as a great noise buffer to outside noise. Others rely on foam on the inside of the frames to gain efficiency but this lessens the air chambers thermal properties, and to expect foam to provide better screw retention just doesnt make sense.